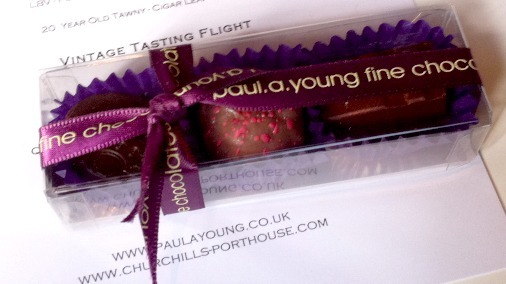 Paul A Young’s collaboration with Churchill’s Port. 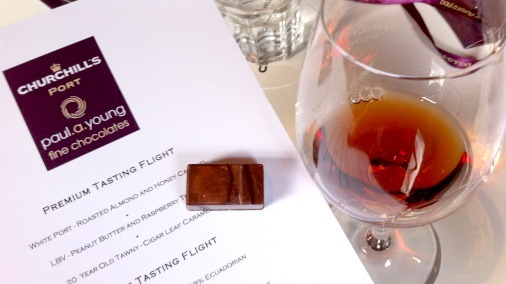 Port and chocolate maestros came together for an evening of indulgent tastes. 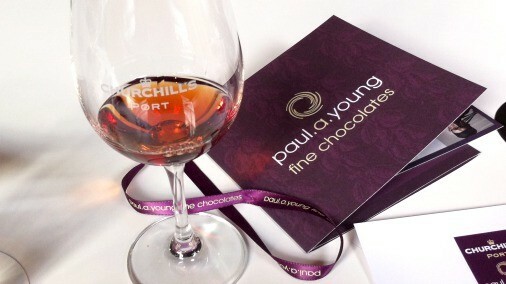 Last thursday evening saw the introduction to a new partnership between Paul A Young Fine Chocolates and Churchill’s Port. 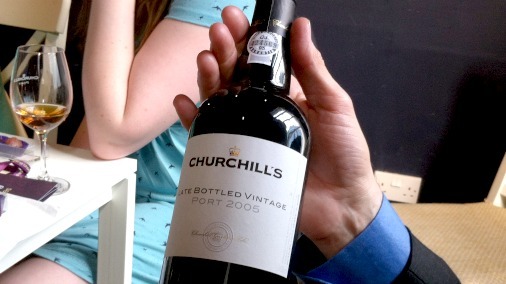 It was held at Churchill’s Port House in London’s Greek Street, a pop up venue whose purpose is to introduce London to the range of Churchill’s Port, by the glass or as tasting flights, in an informal setting with carefully paired tapas available alongside. 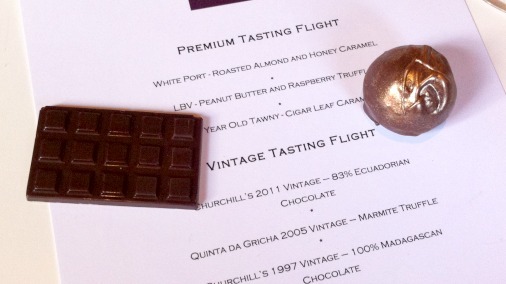 What Churchill’s have done with Paul is create an additional tasting flight with pairings, this time with chocolates. We were very privileged that founder of Churchill’s, Johnny Graham, flew in especially from Portugal. Paul was also there, in ebullient and reflective form, and scion of Churchill’s Max Graham, who heads up the Port House, presided over the whole with charm. Together this trio guided us through what proved to be a delicious and taste-bud-opening event. Paul, Max and Johnny take the floor. 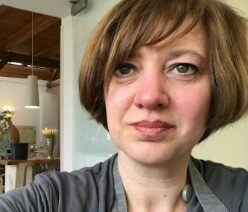 Knowing a fair bit about chocolate and nothing at all about port, I was thrilled to spend time with my favourite foodstuff and happy to be open minded about the latter. While I usually fly solo on these occasions, this time I brought a guest, who was a novice on both counts. Let’s call him the Blonde for ease of reference, not because he isn’t an eminent and highly successful professional in his own right, but just because for this evening it was his untutored responses that brought home to me what a pleasure and a privilege it is to be invited to such tasty and creative occasions. The controversial and delicious white port. The first surprise of the evening came when they poured out the first glass. The Blonde and I were both at a loss, surely port is red? Glancing at the tasting notes it was revealed to be white port. Surely white port is somewhat déclassé? It turns out that white port is the port maker’s best kept secret. As explained by Johnny Graham, who founded Churchill’s 33 years ago to create quality handmade port, white port was traditionally drunk by the port makers themselves. It never used to leave Portugal, but you would find it served chilled as a delicious aperitif in port country. While Johnny did confess to finding it slightly galling when people preferred it to the finest of his vintages, he still thinks it a highly underrated tipple. I would have to agree! The dominant aroma of the white port is that of honey, and while it is light and fresh in taste, its sweetness, as with that of all port, makes it an ideal partner for chocolate. Due to their comparative strength and sweetness they do sit happily where they have traditionally been placed, at the end of a meal. Also a fine time to bring out the chocolates. Although, I’d say forget the meal and just bring on more port and chocolate! 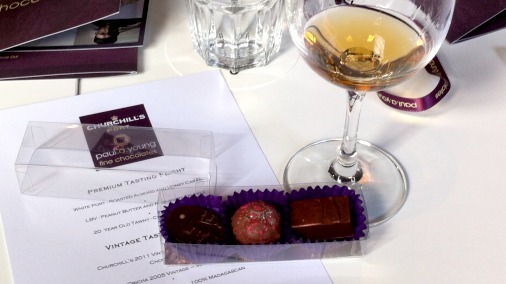 Roasted almond and honey caramel, far left, was well paired with the white port. Paul is famous for his caramels, with his sea salt caramel in dark chocolate having once again retained the gold medal for Europe at last weekend’s International Chocolate Awards presentation in Florence. The chocolate paired with the white port uses honey from a small independent producer in Richmond to produce are silky mellow caramel with a warm a flavour, that combines wonderfully with the port. At the centre of is a whole delicately roasted almond. The crunch and toasted flavour, enveloped by the fine caramel rounded off with a well balanced 66% caribbean chocolate, make this a new favourite of mine among Paul’s chocolates. 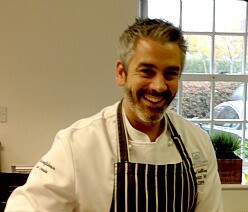 In fact the man himself did say he couldn’t take it off the menu as he is a little bit in love with it. Almonds go wonderfully with port. Apparently a bowl of salted ones are the classic nibble to serve at a tasting. They are indeed a perfect foil for the fruit and warmth of the drink. And this pairing is wholly successful. We did contemplate doing a runner with the bottle. Next on our list was a Late Bottled Vintage, which is considered the 2nd rung port of a given producer after their full vintage offerings. 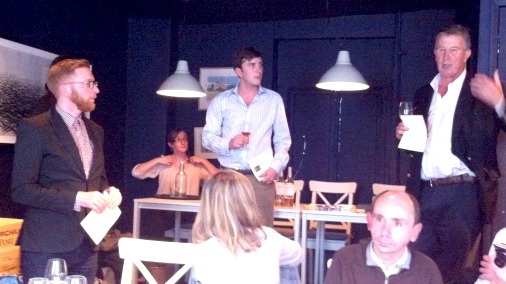 We were also treated to a whistle-stop history of port. Port is a wine, produced from grapes in the Douro valley in Portugal, where the hot weather produces a fruity and sweet variety of grapes. From the 16th century this wine was shipped out and had a naturally stronger and sweeter quality, due to the high sugars in the grape; those that had fermented and some that were residual in the wine. Around the 1780s, when bottling was introduced, producers encountered a new problem. As the wine continued to ferment, thanks to those sugars, they were blowing their corks in transit. To kill the yeasts before bottling port producers starting adding a little brandy, which created a stronger finished product, around 20%vol. This naturally sweet, newly fortified wine caught on, and became what we now know as port. A late bottled vintage is so called because it is left 4 years in the barrel prior to bottling, rather than the 2 for a full vintage. Once bottled, if left unfiltered, both will then continue to age in the bottle. The Grahams described filtering port before bottling as like ‘cutting it off at the knees’, you may get a consistent product that you could sell immediately, but you prevent it from growing further and reaching its real potential. Not so with the 2005 we tried here, which at 9 years old had a good ten years still to continue improving. Its aroma was rich in raisins, and the taste, like its colour, was a burst of red fruit. 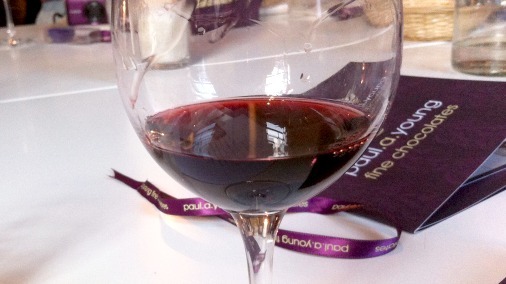 Paul gave us the peanut butter and raspberry truffle with this port. I know this chocolate well, having judged it recently and seen it win gold for Europe in its category at the weekend. The blonde, when he regained the power of speech, correctly pronounced it divine. A layer of raspberry reduction, another of smooth well rounded peanut paste, and the whole enrobed in an indulgent 40% milk chocolate. It is a sweet chocolate, not too sweet, but sweet. So eating it alongside something similarly full bodied, but with the fruit and booze of this port, created great balance. Peanut and raspberry truffle, speckled prettily in the centre. Our next treat, the last of our box of three chocolate paired with a tawny port, constitutes the final pairing in the trio that will now be on offer at Churchill’s Port House. With tawny port and a cigar leaf caramel we were straying into the realms of a gentleman’s club. I half expected Bertie Wooster to enter stage left in a smoking jacket, or 30s jazz to find its way to my ears. There was something stylishly darker about these two, the muted browns, the flavour, the whole experience. Tawny port is selected from the same grapes as a vintage, so has top potential even as it begins its journey. But then it is taken down a different path and aged wholly in wood, which accounts for the dark caramel colour. Port that remains in the bottle, even a very old one, will retain something of the pink of the grape. A ten year old tawny will come from late bottled vintage selected grapes, a twenty year old, like that we tried, from a full blown vintage selection. This Churchill’s 20 year old tawny has to be one of my new favourite things in life. Its aroma is warm and bright, but rich in maple syrup. The taste, although full of caramel, is not too sweet at all. A balancing act of that maple and grape musk. It made me think of a stunning sauce I had of verjus at Tom Kerridge’s place last year. The blonde was experiencing the kind of slow burn shock that Paul’s cigar leaf caramel creates in the uninitiated. He is no stranger to mind altering substances, but you don’t necessarily expect to be taken to a slightly illicit place by a chocolate! For me this chocolate is less about flavour and more about the sensation that a cigar leaf infusion creates. Three glasses of port in, downing my favourite so far, itself with a gentle smoky quality, this adds up to an elegantly wasted in the corner kind of moment. The full blooded beauty of a fine vintage port. 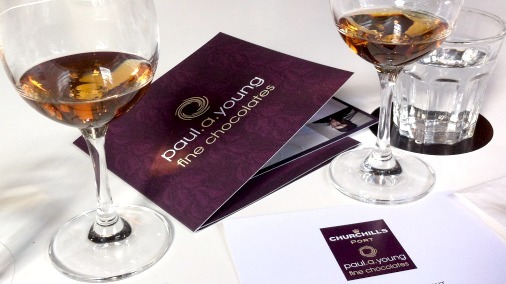 From here on in we were tasting things that aren’t on the official Paul A Young tasting flight at Churchill’s Port House. 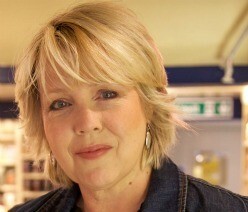 But they are all available nonetheless, and had the blonde and I sinking deeper into that happy corner. Making vintage port is something of a waiting game, so Johnny Graham is creating things, many of which will not reach their peak for thirty or forty years, some of which will be truly great when his great grandchildren pop the corks in 2114. Max described it as being a little like gardening; there is colour you get to see now, but much is investment and creation for the future. Which doesn’t mean it isn’t nice to drink sooner, although apparently it is nice very early, and then closes up for a time, ten or fifteen years, before opening out again to start showing its colours. The 2011 we drank was amazingly creamy and aromatic. It looks set to be a major year, akin to 1927, ’45. ’63. We had the shivers just tasting it, and being told that it was the best year since 1973, already given 97 points by Wine Spectator, did nothing to dampen our sense of occasion. No pressure on that little bottle then! ‘Marmite’ chocolates show the skill of a good pairing. 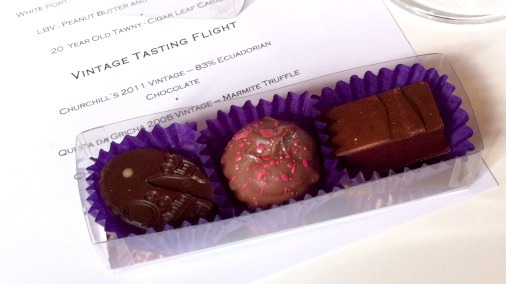 With the vintage ports Paul went three ways, with two mini bars and with his marmite truffle. The marmite truffle is a ‘marmite’ chocolate. Another first for the blonde, he found it surprising, and surprisingly enjoyable. Eating it alongside the unusual single vineyard Quinta da Grincha 2005, rich in plums, made a salty and sweet experience. 100% chocolate can be a tough call, dry and tannic, it is rarely my first choice when I want something to nibble. The Menakao 100% had the ideal partner, and going back and forth between the intense bar and the mellow port was an audacious and delicious thing. Like an opposite reflection of how the LBV port had cut the sweetness of the milk chocolate earlier in the evening, only this time the roles were reversed. In the 83% Ecuadorian Paul gave everyone a pure chocolate treat. This new bar from Duffy Sheardown is smooth, fruity, delicately sweet, and a newly discovered future classic. 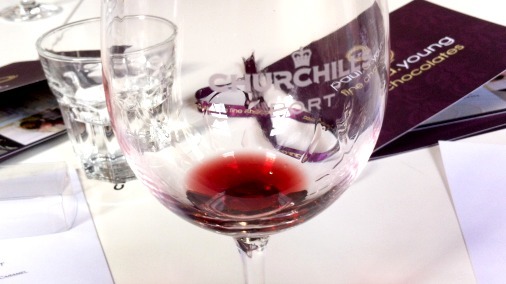 Much like all the wonderful things we were treated to from Churchill’s port! Johnny, Paul, Max and not forgetting the blonde, thank you all for a very fine evening.